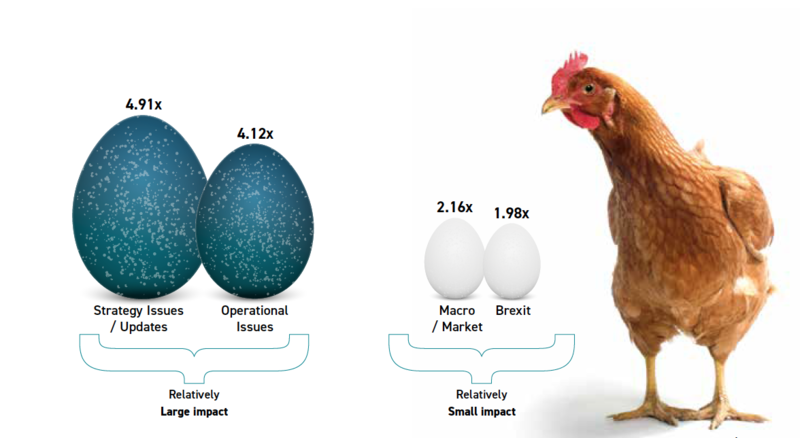 The Anatomy Of A Crisis: Volume 2 – Why Do Markets Overreact To Profit Warnings? We combine our expertise in Corporate and Financial Reputation with our skills in Data Analytics to review past events and draw conclusions about how situations are likely to unfold in the future. In doing so, our research helps Boards and communicators to plan ahead when facing crisis scenarios of their own. Why do financial markets overreact to bad news? For example, in 2018, Company A issued a profit warning announcing a reduction in profit expectations of 10%. The sell-side cut forecasts in line with the Company’s guidance, reducing them by 10%. The consensus target price for the company’s shares also reduced in-line with this reduction. Meanwhile, the shares dropped 20% in early trading and finished the day down 50%. So, what happened? We live in the era of the 24-hour news cycle. Corporate issues make the headlines and then rumble on and on, taking new turns and causing more damage as company responses are analysed in minute detail. Sometimes, major incidents beget huge crises where significant investor responses are justified. In others, we often get the feeling that markets go over the top. We thought the best way to investigate this problem was to look at profit warnings, those public moments that shine a light on corporate failings and pose that most fundamental question to investors of all types: should they Buy, Hold or Sell? Examining 100 profit warnings over 12 months we found the average value a company lost in the 24 hours after a profit warning was 3.58 times the expected impact, based on purely financial considerations. We also found that this multiplier was most pronounced for warnings where operational or strategic missteps were to blame. Those companies with issues caused by external factors seem to be given an easier ride than those where the management appears to be at fault. So, why is this happening? Why are the markets punishing companies so much harder than they should? We spoke to investors to find out. We polled 130 global institutional investors, representing over USD$8.4 trillion assets under management to ask them about their main drivers for responding to a profit warning. The primary individual reason listed was financial, with 28% of the overall vote, but not far behind were some surprisingly emotional responses. First among these was a lack of confidence in business leaders. Other reasons cited included fear of more bad news to come, instinct, distrust and memories of what usually happens in these situations. All of these reasons seem to have more to do with emotion – and the intangible character of company reputation – than the cold hard facts of financial analysis. Our conclusion from these findings is that despite the emphasis placed by companies and the financial community on the numbers, the heart plays a much more significant role in investor decision-making than one might imagine. 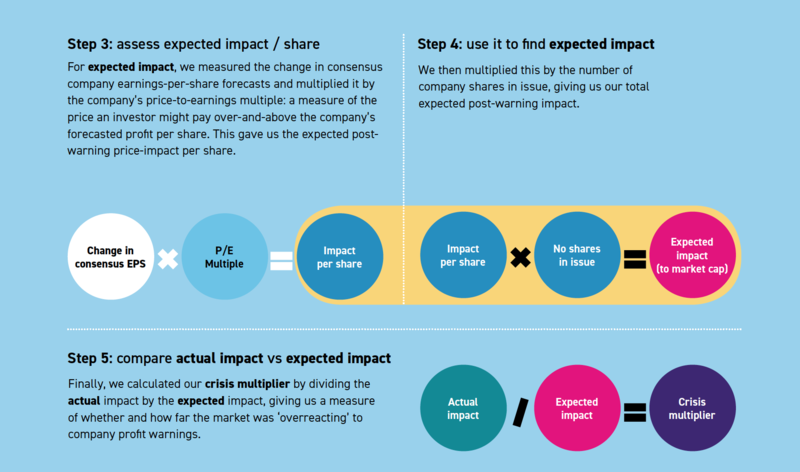 Our aim in this part of the study was to compare the actual impact of profit warnings to expected impact, defined here as the share price impact a company might expect based on the financial implications of their news. To do this we looked at the market reactions to our warnings and compared them with what sell-side analysts said should happen based on their calculations. In seeking to pin down this effect, we looked at 100 profit warnings during the past twelve months. We defined a profit warning as a public statement by the company which causes a drop of more than 10% in consensus profit estimates. If you’re feeling brave enough to guess that the shares will drop by 18%, then statistically, you have the best chance of being right. Across the 100 company situations, we saw an average share price decline of 18%. In total, this equated to £37.8bn of lost value across our 100 warnings. But how should we judge these declines? Are they fair? Do they represent a reaction we can say is rational? Or, is it fair to say that markets are overreacting? And if so, by how much? Is that overreaction more pronounced in particular sectors? And how do reactions vary by circumstance and context, if at all? As we dug into the data, we discovered that the average 18% decline looks like a major overreaction in most cases. Using financial metrics alone, the fall ought to have been much less pronounced. Across our 100 profit warnings we found that on average a company lost, in the 24 hours after their profit warning, 3.58 times more than they should have done, based on purely financial considerations. Additionally, a multiplier of more than 1x occurred in 7 in every 10 of cases (i.e a reaction above what the financials implied). That means our data isn’t skewed by a large one-off. This happens regularly, and it causes significant damage. 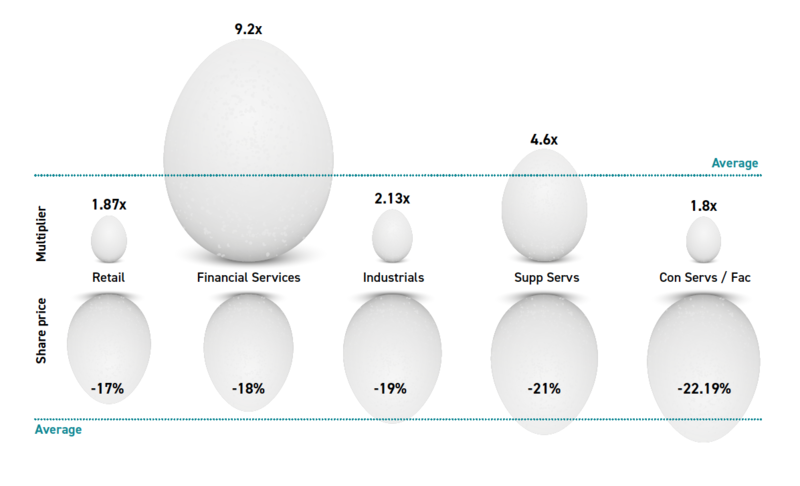 We wanted to break down our analysis by sector to see whether industry type makes a difference in a crisis. The most prominent sectors in our study were Retail with 21 warnings (perhaps unsurprising given the annus horribilis for the High Street in 2018), Industrials with eight, Support Services and Financial Services with six each, and Facilities / Construction Services with five. For sectors with fewer than five warnings, the groupings were deemed too small to be noteworthy. Again, what we really care about is how these sectors’ average share price moves compare to what was ‘supposed’ to happen. This is where the multiplier comes in. Even in the case of a severe share price reaction, a profit warning with a multiplier of 1 tells us we’re seeing a fall in-line with the expected impact of the warning. It represents an example of the system working. 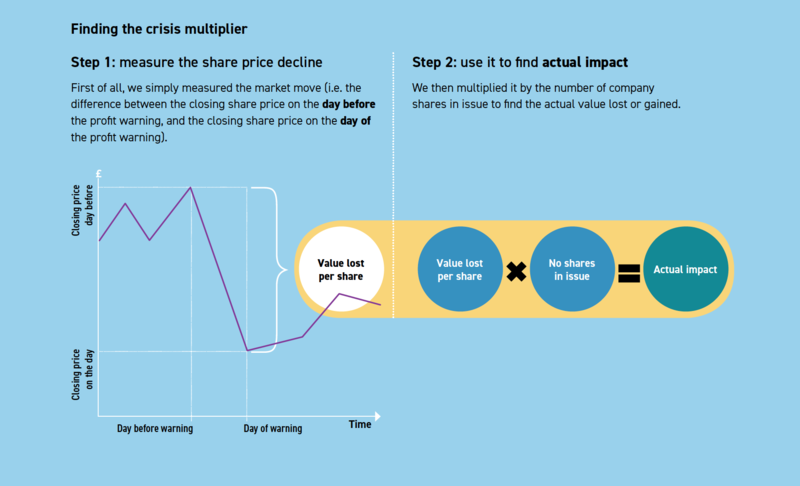 On the other hand, a high multiplier indicates an over-reaction – an example of the negative share price reaction outweighing a warning’s financial implications. In these cases, a purely mathematical version of the company valuation story fails. It can’t properly explain what’s going on any more. The best industry-specific example of this effect comes from Financial Services, where an average 18% share price decline represents a huge 9.2x multiplier. This means companies issuing warnings in this sector saw almost ten times the impact they might have expected. On the other hand, Facilities and Construction Services had a similar share price decline of 22% but actually saw the lowest average multiplier of 1.8x. This is a significant point. Even though the share-price reactions were almost identical, the multiplier tells us the response to the financial services companies was much more severe. For financial services companies about to issue profit warnings, this fact should ring alarm bells. There’s something in investor perceptions well beyond the financials that is driving a highly negative over-reaction, destroying value way out-of-line with expectations. Next, we wanted to see whether market overreactions varied depending on the reasons management teams gave for their warnings. Needless to say, across the 100 events we saw many different explanations, but in order of prominence they can be grouped into the following segments: Market and/or Macroeconomic Issues, Operational Issues, Strategy-related Issues, Brexit-related Issues, and a host other one-offs we’re calling ‘Other’. Are companies treated differently when the reasons for their warnings appear to lie outside of their control? Understanding which kinds of reasons drove the most severe reactions should provide a useful guide to management teams on what to expect and help them decide how to prepare. In the chart below we can see a split between problems which could reasonably be put at the door of the management team – operational and strategic issues on the left – and those which might be reasonably expected to sit outside management’s control – macro, market and Brexit related issues on the right. Notably, strategy and operational issues have caused average share price declines more than 4x the expected outcome, a much hight multiple than market, macro economic or Brexit-related problems. This suggests that even though the share price decline might have been the same, investors seem to be hitting companies harder when they deem the warning to be caused by management missteps. Here we can also see a meaningful link back to our last Anatomy of a Crisis study. There, by looking at share price performance and recovery over a three-month period after a crisis, we identified that company agency has a significant part to play in market reactions to crisis events. For example, an accident or a cyber incident was treated less severely than an incident of accounting fraud or a large product recall. The point in this study, as in the last, is that markets seem to be punishing failures in culture, strategy or planning, while being more forgiving to incidents deemed to be out of a company’s control. It’s human nature that the management team would want to try to make it sound better than it is. It’s like when you’re late for a dinner party – you ring ahead to say that you’re five minutes away, knowing that it’s going to be at least twenty. Then you leave the house and the traffic’s awful, and twenty minutes becomes forty. The data in Part 1 shows us we were right to trust our instincts about the market overreacting to profit warnings. We know it happens. But the real question is, why? Awareness is helpful; understanding is powerful. To get beneath the numbers we decided to ask investors what drives decision-making and causes the multiplier effect to emerge. If this effect exists, what’s driving it? We asked investors about their confidence in management teams to deal with issues, regain control and take the right action to solve the problem. We asked them about their thought processes the moment they see a profit warning ‘hit the screen’, and the motivations and emotions that drive them. We polled 130 global institutional investors working for organisations with a total of just over USD$8.4 trillion assets under management. Our investors were drawn from a wide variety of firms, incorporating investment and mutual funds, wealth management, hedge funds, pension funds, insurance funds and endowments funds. There was also significant variety in the size of their portfolios, with an even spread between smaller funds running portfolios of less than $100m up to funds with more than $1trn of assets under management. The first questions we asked our investors concerned their general attitudes towards crises and the ability of the companies they invest in to manage them. We found that marginally fewer than half of investors (48%) were either confident or very confident that the companies they held could manage a major crisis in the next year. 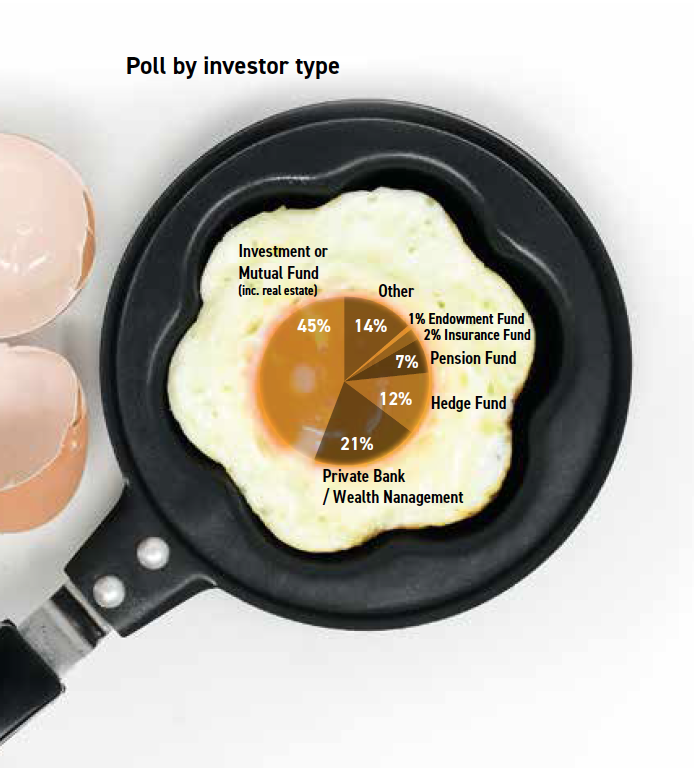 This gives us the sense that the investment community is starting from a fairly sceptical position. A generally low level of faith in management teams to deal with major issues may be driving some of the outsized reactions we’re seeing on the financials. Turning specifically to profit warnings, we saw that 86% of investors agreed with our hypothesis that the community at large overreacts to profit warnings. If the clear majority of investors think the market overreacts, then why do they do it? This may be an example of what behavioural economists call the ‘bias blind spot’. It means we see ourselves as less biased than others – allowing individuals to recognise a collective problem without changing their own behaviour. What Are Investors’ Main Considerations Following A Warning? First things first, it’s important to note that financial considerations were still the largest single factor driving investor reactions to profit warnings (28%). Still, that only represents just over 1 in 4 investors looking straight at the numbers. It also means 72% turn first to non-financial considerations when they pick up a warning. The 72 percentage-point share of non-financial drivers was distributed fairly equally among a range of what we’d call reputational considerations: matters to do with trust, emotion and confidence that go beyond the purely rational into the realm of feeling and instinct. Most prominent among these were a failure of trust in management and the fear that the warning might be the first in a string. 9% of investors also called out their negative memories of past events. And fears that investors have about companies reoffending really do seem to be born out in the evidence. Indeed, across our 100 cases we witnessed 30 instances where a company warned more than once during our one-year study period. So ‘what next’? So, the combination of a lack of confidence in management, the fear (and likelihood) that more bad news is yet to come, and the pain of having been burnt in the past all come together to drive a highly emotional reaction to company news announcements. Moreover, emotional drivers heavily outweigh financial ones. And we think we have a good idea about why this is happening. The financial information given in a profit warning, even if it includes specific detail about impacts on future periods, is still only really clarifying the picture of ripples caused by events in the past. By their very nature, the events causing the profit warning have already happened. We are where we are, and in prioritising questions like, ‘do we think you can fix it?’ or ‘do we really believe what we’re being told?’ over ‘what has happened?’ or even ‘how bad is it?, investors seem to be telling us that what really matters is not where you’ve come from, but where you’re going next. In the final reckoning, we think these questions really all come down to matters of trust, and more specifically, trust in a management team’s ability to get the ‘what next’ part of the story right. So, how can communicators and investor relations professionals build trust? What can they do to ensure the company news, even if it’s negative, lands as well as possible? By way of a reminder, The Anatomy of a Crisis series is all about putting meat on the bones of some of our instincts about the way crises and their protagonists behave. And to summarise, in this study we found that markets do tend to overreact to profit warnings – by a degree of 3.5x – and we’ve also seen reputation emerge as the major driving force behind the investment decisions giving rise to that multiplier effect. There must be significant scope for companies to reduce the crisis multiplier by addressing issues of trust and confidence head on. That way, when a warning lands, reputational credit in the bank can act as a buffer to defend the share price and ultimately protect company value. We like to think about fixing the roof while the sun is shining. Make sure you’re engaging regularly with existing and potential holders as well as the sell-side. Make sure you’re telling your story at the right events. Make sure you’re dealing with inbound inquiries promptly and make sure your reporting, disclosure and presentations are all watertight, tied to strategy and future-facing. Issues in your business can emerge from anywhere. As well as thinking about investor audiences, think about your customers, understand your employees and consider policy-makers and regulators. Ask them how they think you’re doing face-to-face, address their concerns and think about how giving them confidence in you might enable them to speak in your favour in tougher times. Engage with the editors and reporters that matter most. Make sure they know where you’re coming from. Who you’re like and who you’re not like. What’s important to you, what isn’t, and how you fit into and impact the wider world. That kind of context will be invaluable when they put pen to paper in the event of bad news. and why, and in doing so bring the market’s reaction in-line with that warning’s financial implications. Having identified the crisis multiplier and understood much about why it occurs, we can frame this problem as an effort to reduce that multiplier to zero. While this might be a utopian vision of what looking after your reputation can achieve, we think it’s the right ambition, and there’s no time to start like the present. The research was conducted by FTI Consulting’s Strategy and Research team with n=130 global institutional investors, representing an accumulated AUM of USD$8.4 trillion. An online research methodology was undertaken where respondents participated between 24th May – 15th July 2018. Please note that the standard convention for rounding has been applied and consequently some totals may not add up to 100%. Further information on the results and methodology can be obtained by emailing dan.healy@fticonsulting.com.